The Big Idea: Kids find comfort in concrete, visual reminders that let them know what to expect. 1. Print a few weeks’ worth of pages at a time, so you can use this every week. Add dates to the calendar (kids can help). 2. Together, talk through the plan for the coming week (for instance, “Let’s mark the days you’ll be with Mommy this week.”). Choose a consistent way to represent this (such as a certain color or shape to mark “Mommy days”). Highlighters can be fun! 3. Add things kids have to look forward to each week (such as movie night, a play date, or a trip to the playground). Help children display the calendar so that they can see it often. 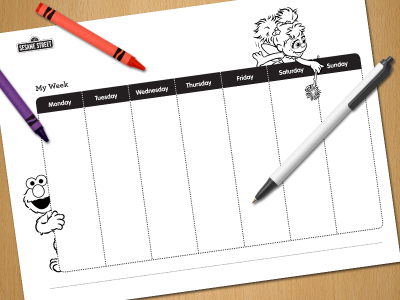 Kids may also like crossing out each day to keep track of time.